This locksmith’s basement is more than just a workshop. It’s a work of art, an installation of astounding depth and breadth, and one that’s changing and evolving along with the town the locksmith serves. 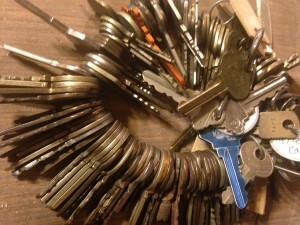 He has keys to every building and house in the town, plus the keys to locks that have long been replaced. But what does he do with all these keys? What is his work of art? Based on the Royce Leville short story Willard from The Book of Names, The Locksmith is a strange, intriguing and frightening television series that may keep you awake at night and make you question the ordinary people who cross your path each day.